Saw-scaled viper (Echis carinatus) are relatively small snakes growing to the length of 12-20 inches as adults and 3 inches at birth. It is amongst the big four commonly found venomous snakes in India. 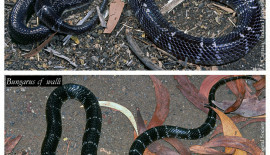 This snake is quick to strike when provoked. Echis is the greek word for viper. They are a genus of venomous vipers found in the dry regions of Africa, the Middle East, Pakistan, India, and Sri Lanka. They have a characteristic threat display, rubbing sections of their body together to produce a “sizzling” warning sound. 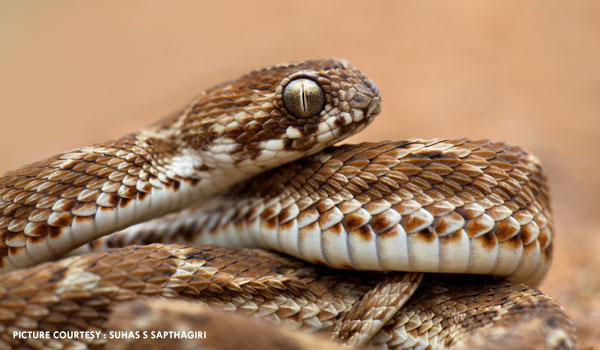 In India this snake occurs in rocky regions of Maharashtra, Rajasthan, Uttar Pradesh, and Punjab. They are mainly nocturnal and are found basking in the morning sun on short thorny bushes or on rocks. 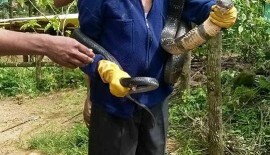 These snakes rest under rocks, behind lose tree barks or at the base of a thorny bush. They climb well and are found on active roads and paths during nights to seek warmth. They move by side winding and feed on small mice, lizards, frogs, scorpions and insects. The Saw Scaled vipers are viviparous and give live birth to 4-8 young between April to August. Females may produce two clutches in a year. Common look alike of the Saw Scaled viper are Common Cat snake (Boiga trigonata), Common Sand Boa (Gongylophis conicus), Russell’s Kukri (Oligodon taeniolatus) and Sind Awl-headed snake (Lytorhynchus paradoxus). Field Guide Book : Snakes of India by Romulus Whitaker and Ashok Captain.